Happpppppy Monday!! How are you lovely people? I hope your weekend was fabulous and full of wonderful Easter festivities. If you follow me over on Instagram you know my weekend was a bit crazy to say the least, but it’s a new week and I’m ready for a fresh start. 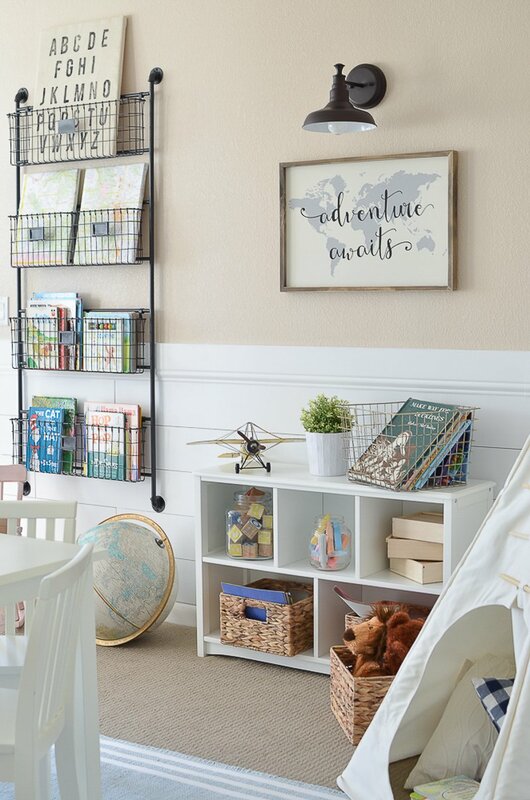 And it’s a super exciting day here on the blog because I finally get to show you all a portion of our home that I’ve never really shared–the kids’ playroom. Eek! Cue the happy dance! 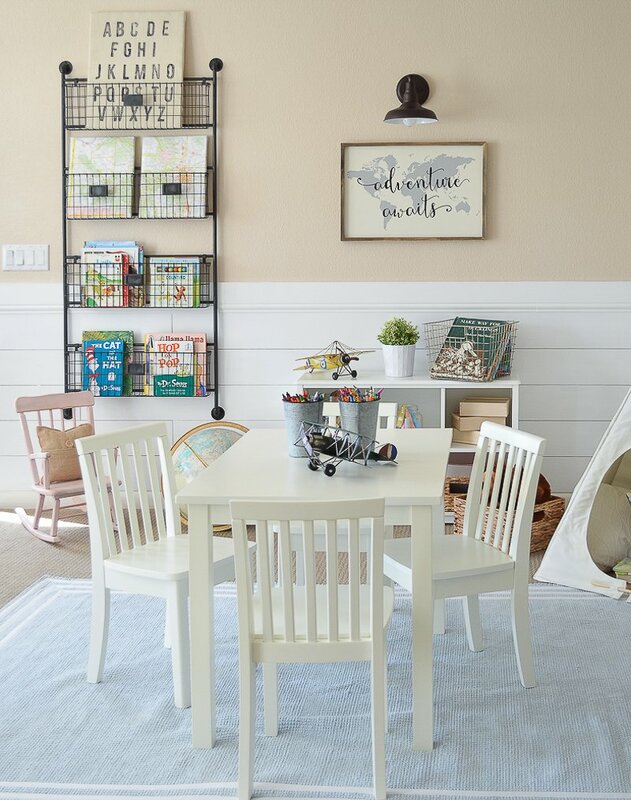 I’ve been dreaming about doing a modern farmhouse playroom makeover for my kiddos for a loooooong time now, so when I recently got the opportunity to team up with Birch Lane for this exact project, I was pretty darn ecstatic. Not only does Birch Lane have high quality, long lasting products, but I feel like everything is well priced and perfectly suited to my ever growing obsession with the whole farmhouse style vibe. Everything came together beautifully and I’m just over the moon excited to show you how this space turned out. My kiddos absolutely LOVE it. Now, in order to really do this space justice, I have no choice but to show you the sad state of things before we started on this makeover a few weeks ago. Don’t judge me, people. Crazy, right? I just can’t get over the difference in here. It feels so fresh and clean now. And there is so much more organization happening, which is awesome. 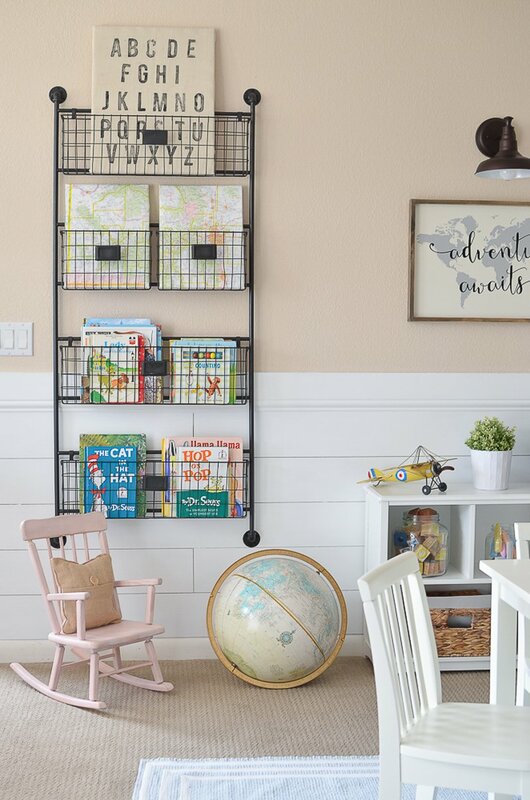 I really love this big mounted wall basket, it’s perfect for storing all our books and it’s easy for the kids to access. And of course I couldn’t resist doing planked walls in here. You guys know I love me some planked walls. 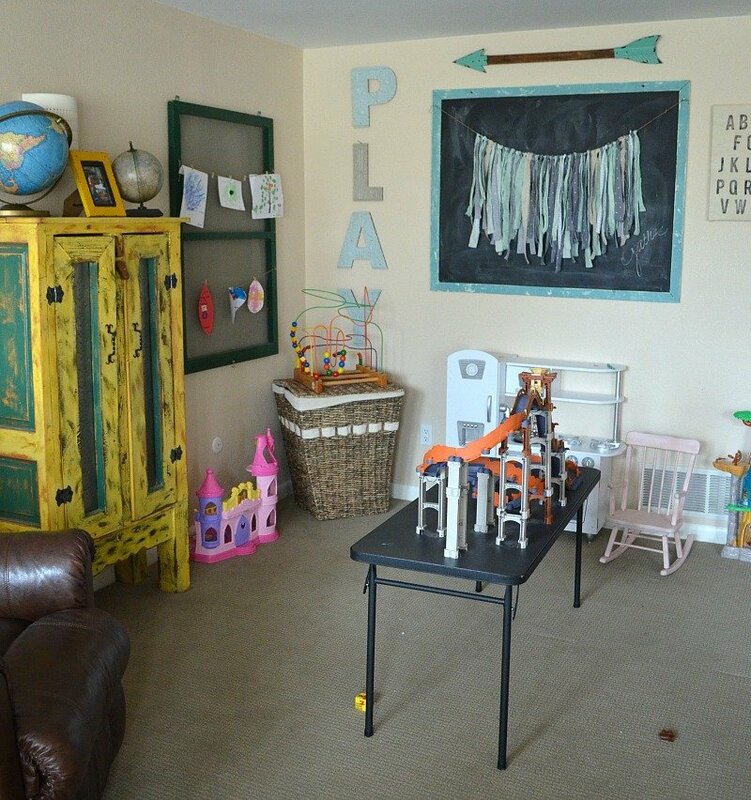 This playroom is actually in the corner of our basement, so adding the planked wall really helped to define this area as its own seperate space. I think that made a HUGE difference in the overall look and feel of this space. I love, love, love this little white bookshelf (this is actually the Matilda bookshelf, you can find it here). It’s the perfect size of the kiddos. I have some of their craft supplies and paper stored in those woven baskets on the bottom there. 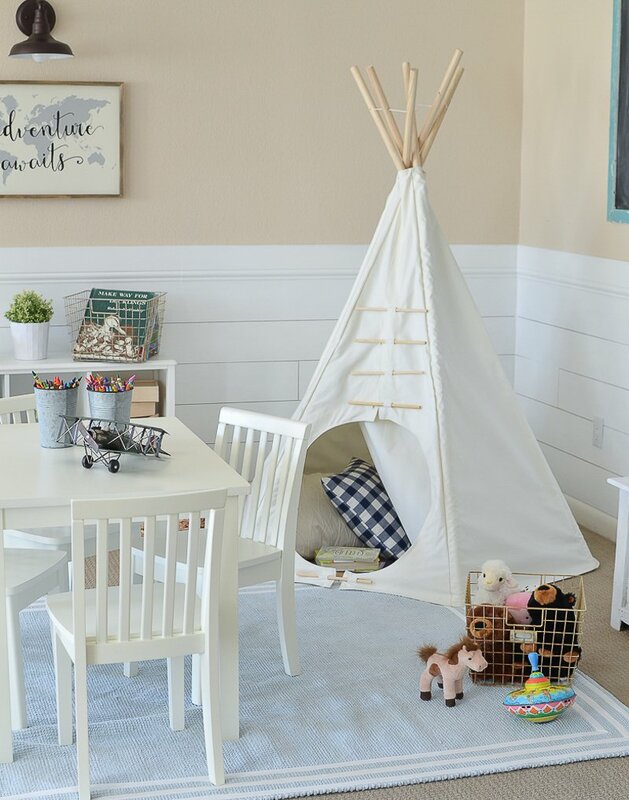 My favorite part in the entire playroom is hands down this adorable teepee. I mean, how cool is this you guys?! Owen and Allie went completely crazy with excitement when we first set it up. They absolutely love it. And to be honest, I’m a little jealous they get to play in this. I want an adult size version for my room! 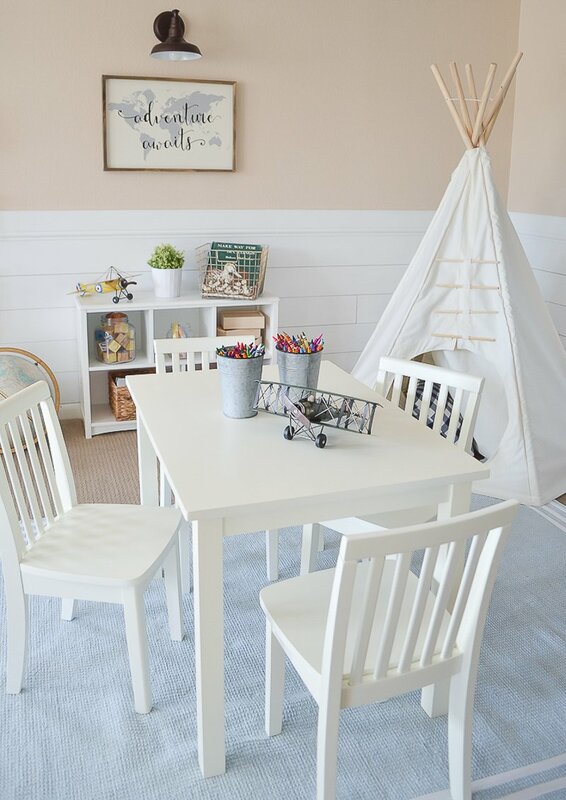 One of the things I really wanted to add to this space was a designated craft/activity table. My kids love to color and draw, so having this little table in the middle of the play area is awesome. And they also love eating lunch and snacks here too. They’re always asking for a “picnic” in the playroom! I’m sooooo happy with how this space turned out and the kids are in love with it too. This project was long overdue, but it feels so good to have it done. And I’ve actually noticed something really interesting since finishing this project. Now that the kids have a more organized and defined play area, they seem to do so much better at actually playing happily and they don’t get bored as quickly as they did before. If you have little ones at home you know what I’m talking about–keeping them entertained and happy isn’t always an easy task! But it’s like now that the clutter is cleared out, there’s more organization, and more defined play spaces, they actually spend more time in here and they’re more content. I guess the same is true for adults too–we’re more at peace when things are organized, decluttered, and tidy. It’s like magic! 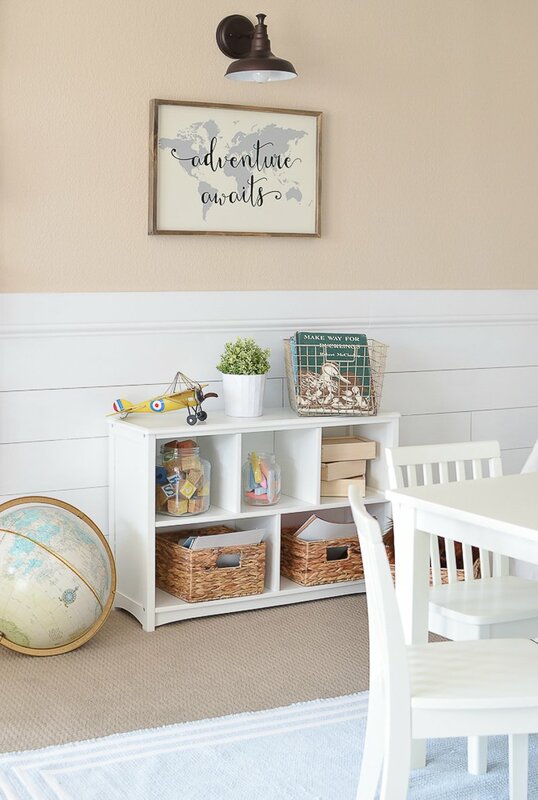 There are three other awesome bloggers involved in this Birch Lane Kids Campaign. Next up is Clarissa of My Wife Styles–she’ll be sharing her post tomorrow. All righty my friends, that’s all for me. 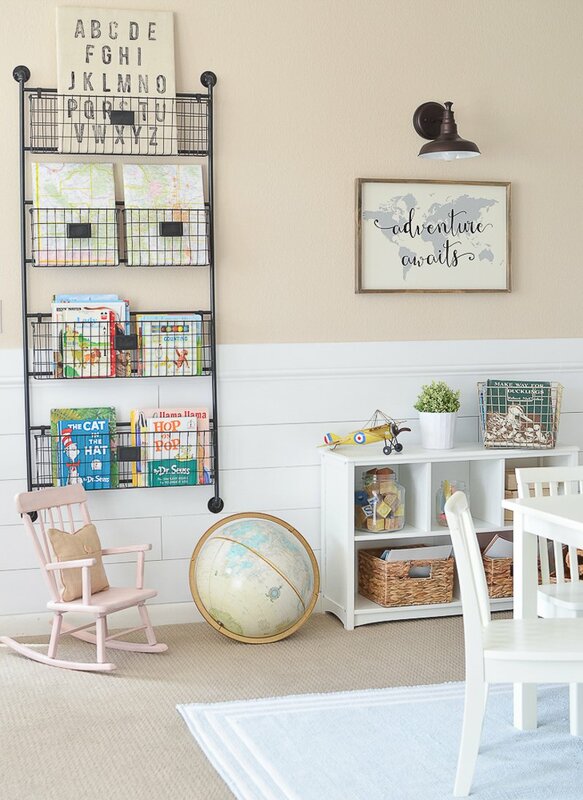 I’d love to hear what you think of this little modern farmhouse playroom makeover. And of course let me know if you have any questions, I always love chatting with you guys! I love it! its so welcoming and CUTE! Did you mention where you got the poster “Adventure Awaits”? Hi Joan! I actually think I found that sign at Hobby Lobby a few years ago. Thanks for dropping by this morning. Have a great week! Phenomenal!!! 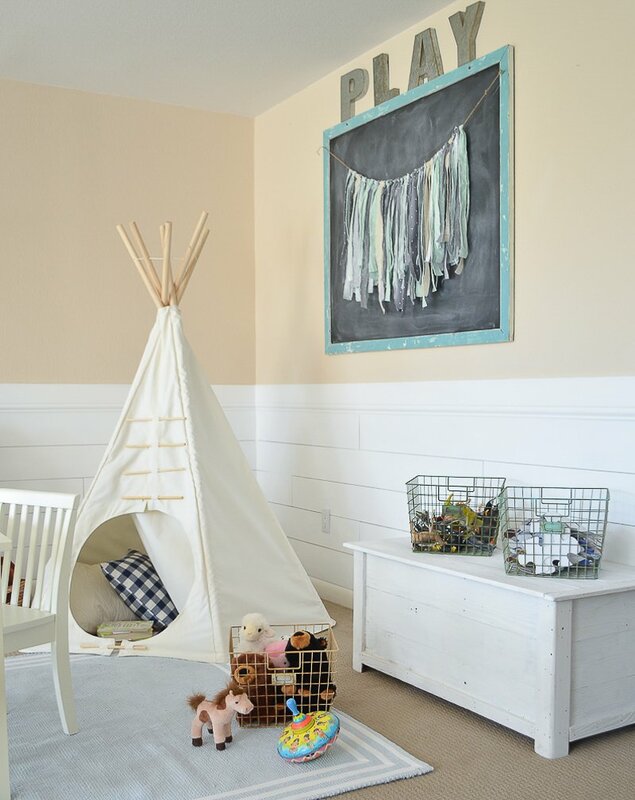 Thank you so much for sharing this adorable space…Your kiddos will always have memories of their special little space at home that mom created just for them! Aw thank you Gloria, I’m so excited to make lots of fun memories in this room! It is absolutely darling! 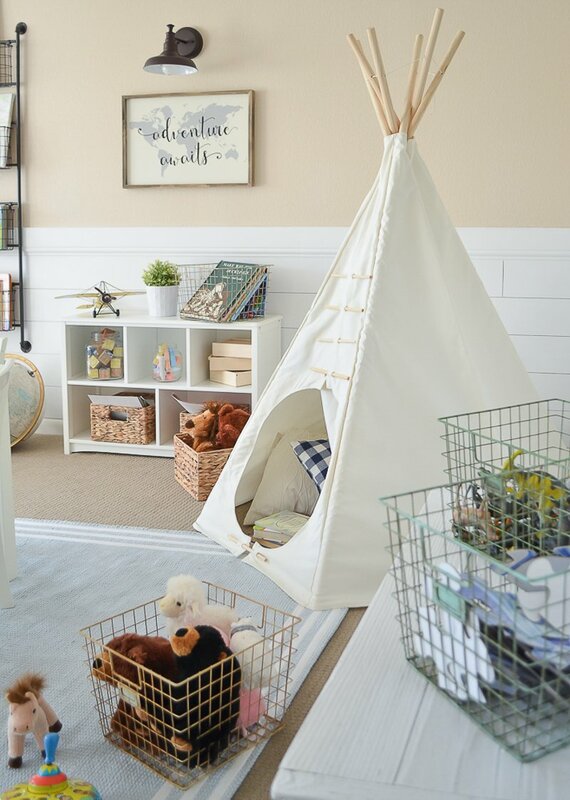 I love the neutral colors, and the uncluttered look where things have a place to be put away that’s easy for kids to do themselves. Thank you Heather! And you’re exactly right–the kids can put things away easily–everything is within reach now. Win win! So cute! Where are the wall sconces from?? Absolutely perfect!!! Wish I still had little ones. Great job ???? I think what you did to transform your children’s play area is nothing short of “AWESOME”! Sarah, I love everything you post, but this just might be my favorite transformation to date. KUDOS for a “creative” and “charming” job well done ????❤️???? What a great transformation and how wise to get it done before the new baby arrives . This space is perfect and just flows with everything else you’ve done in the house. 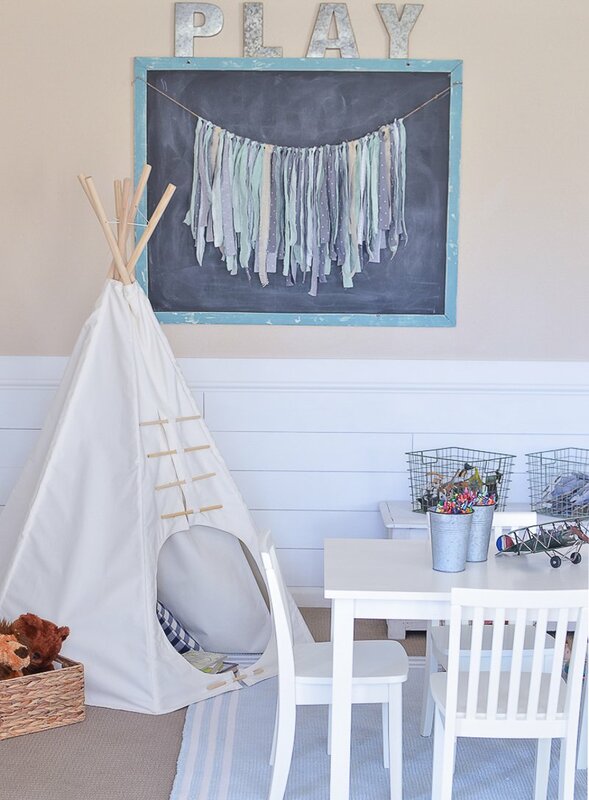 Hi Sarah…..I just love what you did with the kids playroom. OMG what a fabulous change. they will love it. what a difference. you have a great eye. thanks. OHHHHHH…..MYYYYYY…..GOOOOODNESSSSS!!!! This is amazing. I can’t believe the transformation. I love how it turned out. Great job girl. 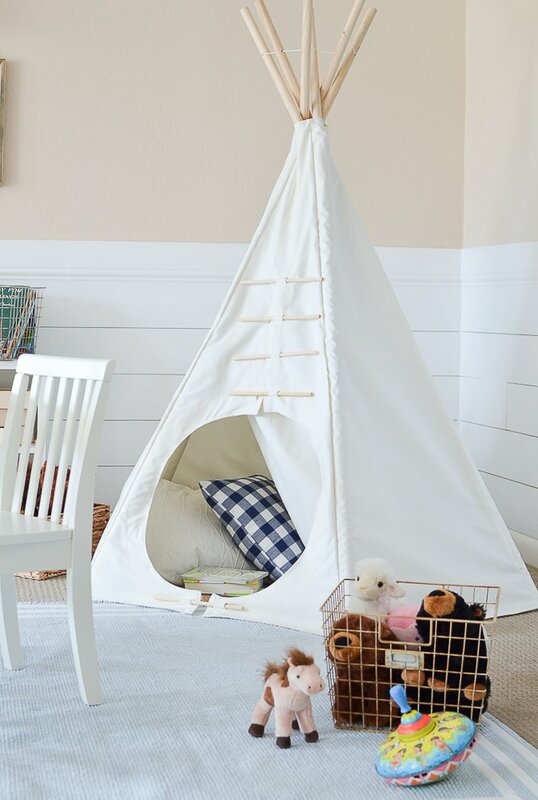 And ditto on that teepee in adult size. I’ve also thought how awesome it would be to have an adult sized baby b’jorn. 🙂 Haha, can you imagine?! 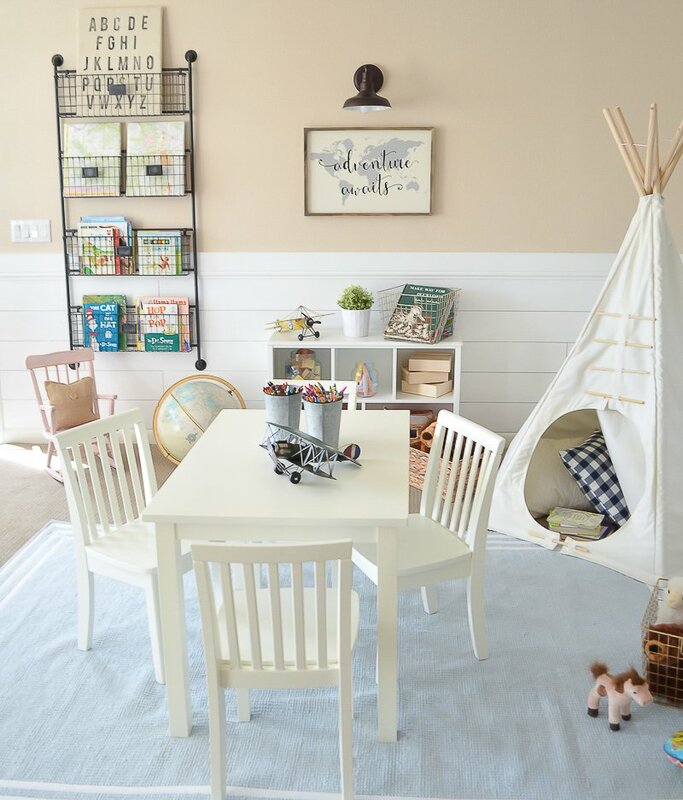 Hi, this is just the cutest play room ever! Where did you find the alphabet sign? Thanks! I actually made that alphabet sign, it was super easy! Where did you get the toy box from? Super cute! Hi Brittany! 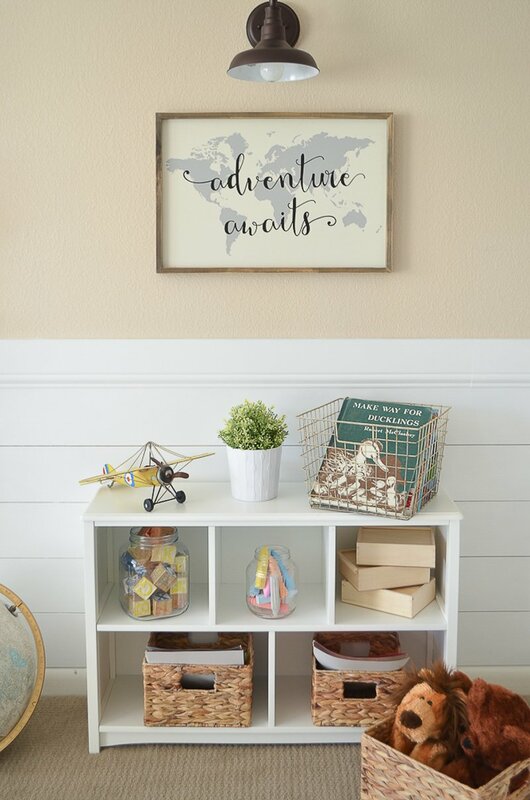 That toy box is just a thrifted find I got years ago and painted white. This is absolutely stunning, no wonder your kids love playing in here! 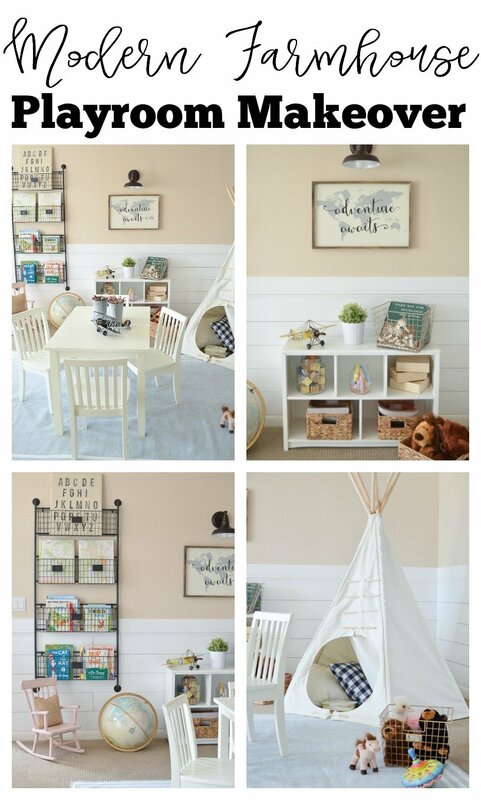 Lots of inspiration for our own playroom revamp, thank you very much. Where did you find the lovely blue rug? I loooove this space! Its the perfect mix of function and pleasing to the eye! Im not sure if you mentioned it in your post and I just missed it, but what paint color did you use for the walls? Thanks Amanda! That paint color is Merino Wool by Sherwin Williams. Wow this is fabulous! Do you think the plank walls make your space feel bigger? What about taller? I’ve wanted to add a chair rail to my downstairs for ever but this looks easier based on our layout. Would love any input you have . Thanks! Hi Stacy! Yes, I definitely think it makes this space feel bigger and brighter too. And it was really simple to do, we got this all up in an afternoon. I’d definitely give it a try! Is there a tutorial for the plank wall on your site? Where did you get the cute wire bookshelf? Love everything about this room! I love this! Where did you get the globe? It’s just an old antique globe we’ve had for years! Hi! This is such an amazing space! I was actually looking at this bookcase on wayfair the other day but couldn’t make up my mind. Would be interested to hear how it’s holding up after several months of play? Thanks! This room is amazing!! Was wondering how you made your canvas, and where you got those airplanes? I also am curious where she got the airplanes! Such an adorable touch! those were from Hobby Lobby!! Hi there! Beautiful playroom. Would you be willing to share the source for the ABC sign? Thank you! That was a DIY project I did actually! Just wrapped burlap over canvas and stamped the letters on it. Easy!